After I gave my speech to the Downtown Rotary Club on June 16, I got an e-mail from the retired Episcopal Bishop, David Reed, who was in attendance, inviting me to meet for breakfast. I eagerly accepted since I had met him many times when I was pastor of our cathedral. The Episcopal Cathedral is on Second Street, only three blocks away from the Cathedral of the Assumption on Fifth Street. Bishop Reed was not only the Episcopal Bishop of Kentucky, he was a bishop in two south American countries before that! He was a bishop in Columbia and Ecuador, as well as an assistant bishop in a couple of places in the United States. Bishop Reed was a friend of our Archbishop Kelly. Bishop Reed has had some amazing experiences. As an observer at a Eucharistic Congress in Columbia, he was given a pectoral cross (the cross worn on a chain around the neck of a bishop) by Pope Paul VI, something he still wears on occasion. Bishop Reed is a wonderful man with years of interesting experiences, somebody anyone would like to have Eggs Benedict with at Wild Eggs. "Catholic Beginnings in Maryland." It is the story of my family's coming to the new world. I thought this would be a good time to post something about my Knott-Mattingly history. My great grandfather, Francis Marion Knott on his wedding day. His father was Raphael. Raphael's father was Clement, who migrated to Kentucky from Maryland. His father was Richard Basil. Richard Basil's father was Ignatius. Ignatius's father was Francis (born 1649). I am also related to other Maryland Catholic families: Mattingly, Mills, Hardesty, Basham, Drury and Cole. Mt great grandfather toward the end of his life. My grandfather, Leo Francis Knott. The building in the middle was torn down and most of the horses were gone before I was born. It was a business called Owensboro Wagons. The General Store was still here when I was growing up. I even worked there when I was a high school seminarian. The store is now closed, but the small post office lives on. My brother owns the building today. I was born in the house on the right. Almost dying at birth, my country midwife grandmother not only delivered me she baptized me right there in that house. It was actually the "Hotel Rhodelia" (seriously) at one time. The middle building was torn down before I was born, but the store to the left was known to me as Vessel's Store and US Post Office. 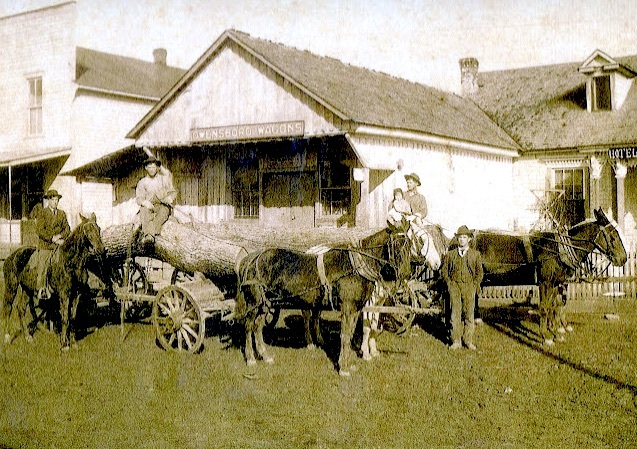 My grandparents lived across the road from the store in a small house that was originally a saloon. Here is a bit of Rhodelia's Vessel's Store history - an egg candler. It is actually made out of an old Gulfspray Insect Killer can with a light bulb inside mounted on a piece of recycled crate wood. When farmers brought in their eggs to sell, they had to be passed over a light to see if they were fresh before the owner bought them. I actually did this when I worked at the store when I was home for the summers from high school seminary. John and Sandy Vessels gave it to me when they closed the store because I remembered it. It has to be over 100 years old because it was very old when I used it. My baby picture from 1944.
my father and my uncles and aunts around 1933. 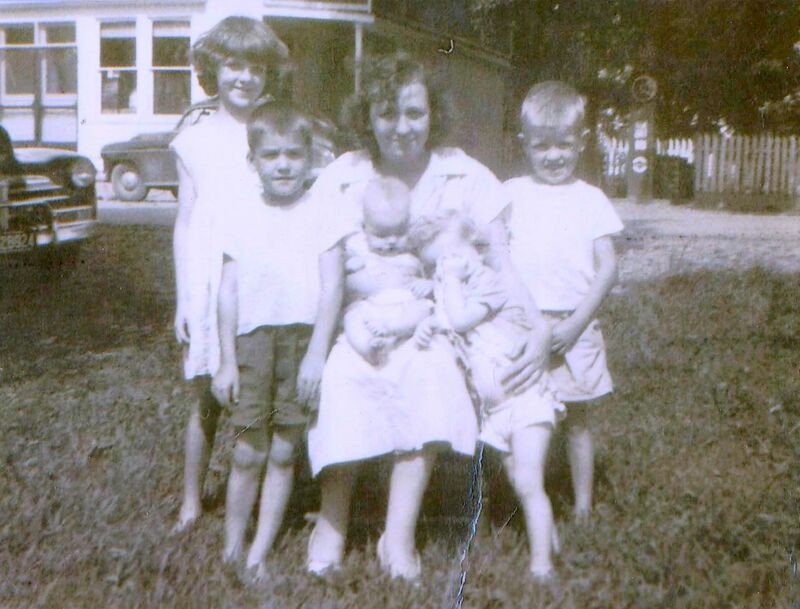 My mother's family before she was born - Isaac and Mary (Chappell) Mattingly. They were also part of the Mattingly clan that migrated from England to Maryland to Kentucky. A distant aunt of my mother married a distant uncle of my father (about five generations back). My mother classmates at the one-room Bunker Hill School. That's her in the front row, left side, third from the end, plaid dress. My mother, Mary Ethel, on the end at the left side. My grandparents, Isaac and Mary Mattingly, later in life and as I remember them. 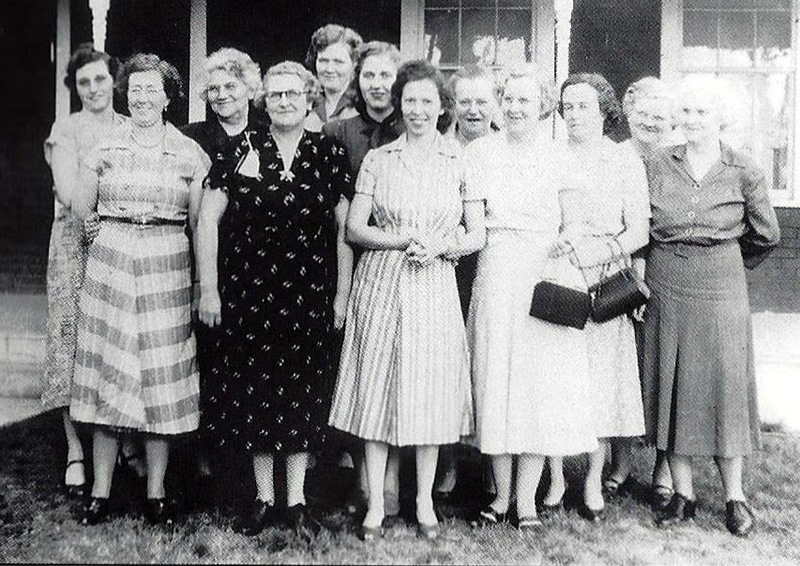 That's my grandmother again, on the right, looking out from behind the dark haired woman in the middle of the front row. She belonged to the Rhodelia Homemakers Club. They quilted, gossiped and ate lunch together at each other's houses once a month. My grandmother gave me a small section of her garden and taught me how to raise vegetables and churn butter. My poor mother about 1949. We lived in the house (picket fence in the background) to the right of the gas pump till I was in the 6th grade when we moved to a house about 1/4 of a mile way - the suburbs. Brenda, Gary, Nancy, Lois and myself on the right. My sister's first grade class at St. Theresa Academy. I would be one year behind her. I would have worn overalls and heavy work shoes to grade school, just like most of these guys. My First Communion took place in 1952. I was seven years old. I remember it well. I can remember the very spot where I knelt to receive Communion and being stressed out about the possibility of "breaking my fast," which would have meant that I would have to wait another twenty-four hours and miss receiving it with my class. My Confirmation took place in 1956. I was twelve years old and only two years away from entering the seminary. My 1959 sophomore high school seminary picture with Saint Thomas Seminary in the background. I was fifteen years old. How I survived that place for six years, is still a mystery to me! I am "John Boy Walton" in my family, a writer and the first to graduate from college. "Each person has inside a basic decency and goodness. If he listens to it and acts on it, he is giving a great deal of what it is the world needs most. It is not complicated but it takes courage. It takes courage for a person to listen to his own goodness and act on it." It occurred to me the other day that I see a whole lot of goodness in the people I meet in a week's time. Their goodness reminds me of the goodness that makes you want to lick your plate when you have experienced something truly delicious. Yes, we may experience a lot of meanness in a week's time and that meanness may get the lion's share of attention, but if we pay careful attention we will no doubt notice that we also experience some remarkable morsels of goodness that are worth savoring as well. Let me count some ways! 1. The people who have generously supported me in my mission projects have simply been amazing. I know that behind much of it has been personal support to me as much as it has been to the the people down in the islands. 2. The people who constantly affirm me in the writing of my column "An Encouraging Word" are lavish in their praise and appreciation. They make me feel like I am making a difference in their lives - something that every priests lives to hear. 4. My family is a constant blessing, a quiet presence that I know is always there should I ever need them. I am proud of the them and they let me know that they are proud of me and never leave that in doubt. We never fight or argue or forget each other. Their support in my life is like the sun, even on those days when I don't see it, I still know it is there. 5. The residents of the nursing homes I visit inspire me constantly with the way they handle their situations with courage and grace. They readily show their appreciation for the time I make for them. The people who care for them are heroic in giving those residents the care and attention they deserve and need. Their work is not easy, but they seem to see it more as a ministry than a job. They are inspiring to watch. 5. My new friends down in the islands have accepted me and welcomed me in a way that I find fascinating. They have brought a new enthusiasm for ministry into my retirement years that keeps surprising me. 6. Former parishioners, as well as seminarians and college students, who call me out of the blue, send me cards and letters, contact me on the internet and light up when I run into them unexpectedly, are gifts in my life that keep on giving. 7 My circle of friends who help me maintain my computer, my blog, my column, my car keep me going and make me look good. Others comfort me when they get mad when I do not call them when I need help. In short, there is so much goodness out there. The people in my life are unbelievably good to me. It all leaves me filled with gratitude, appreciation and pride. I filled blessed, fortunate and privileged to be the beneficiary of so much acceptance, love and kindness. They make my life not just "finger licking good," but "plate licking good!" YOU DON'T HAVE TO EARN IT! Martha, Martha, you are anxious and upset about many things; one thing only is required. Because I didn’t really understand it, I never used to like this Martha and Mary story very much. In fact, I believed that Martha got a bum deal here. Here she is slaving away in a hot kitchen, trying to get a meal on the table, while her sister Mary has parked herself in the living room with the guests, listening in on the living room conversation. Even when poor Martha comes into the living room, mopping her brow with her apron, to ask for a little help, she not only doesn’t get it, but she also gets a quick reprimand for being such a workaholic. These days, I understand the story a little better. Jesus is not condemning good deeds or hard work in order to praise contemplation. In the sequence of the gospel, Jesus has just finished telling the story of the Good Samaritan, in which good deeds are praised. In fact, Jesus ends that story by telling his disciples, and us, to go and do the same. What he is doing here is simply reminding Martha of the primacy of listening to the Lord and also reminding her why, and for whom, she is doing all her work to begin with. So this story is meant to balance the story of the Good Samaritan. It’s not a matter of either/or but of both/and. It’s a matter of action and contemplation. I know these two women. They have moved into my head and they have been arm-wrestling for years over who is going to be in charge of my thinking. For most of my life I’ve sided with the busy and anxious Martha. But recently, as I’ve gotten older, Martha is really getting on my nerves. Mary, after all, is the smart one. Both of these characters want to serve the Lord, but they do it for different reasons. Martha is that part of me that believes that I am not really worth much unless I do a lot. Martha is that part of me that is always anxious, always lecturing myself, saying that I ought to be ashamed of myself for not being perfect. Martha is that part of me that believes that if I accomplish a lot, then maybe I can make up for my deficiencies. Martha is that side of me that believes that my worth is directly tied into what I can do. If you have a Martha in your head, I am sure you too are totally exhausted most of the time by your busyness about many things. I’ve just recently discovered Mary’s point of view. Mary has a message for those of you who feel you “aren’t worth much” because you “can’t do much anymore.” Mary knows that she is already loved, and so she doesn’t have to do a thing about it except enjoy it. Mary is that side of me that wants to believe that God already loves me, no matter what, just as I am right now, whether I do anything this week or not. Mary is that part of me that wants to believe that God loves me and I am worth something just because I am, not because I am a priest or I’ve earned a few degrees or I can pastor three or more parishes at once. Martha always leaves me anxious, but Mary leaves me encouraged and gives me mental rest. Martha is always trying to do something to get God to love her while Mary understands that she is already loved.